Paulmann Licht is a lighting company founded with one simple goal: to improve their customers’ quality of living through lighting. A family run business, they have grown over the last 35 years and now operate in over 40 countries, offering over 3,000 award-winning luminaires, lighting systems and accessories. In December 2015, the new online shop from Paulmann saw the light of the online world, developed based on Shopware 5 Enterprise edition. The Shopware Enterprise Partner hmmh supported the traditional brand as they reoriented into digital commerce. Next to the pure sale of their products, Paulmann places a huge emphasis on brand communication and consultation. They offer tutorial videos, extensive product descriptions, lightning plans, light assembly tips and other services, making it possible for end customers to connect with a wide range of support from their very first visit to the shop. 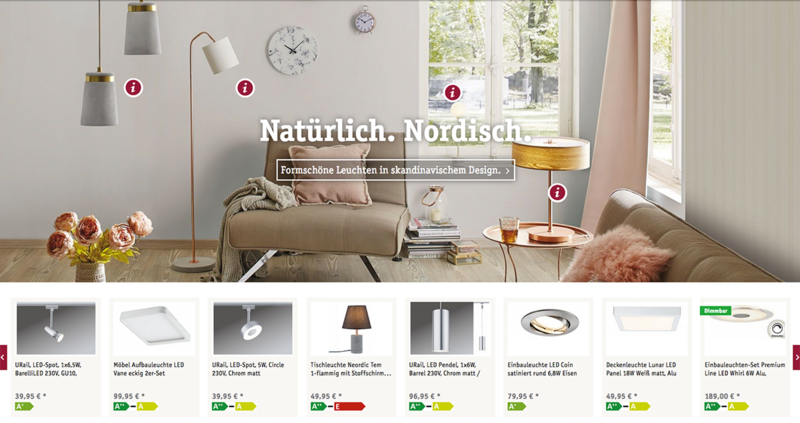 Paulmann makes use of one of Shopware 5’s greatest assets: Emotional Shopping. Full-page images play a part in staging the product recommendations and the fully responsive design makes the shop intuitive to explore. Throughout the shop, Shopping Worlds is used inspire customers with lighting ideas for their home. After operating their online shop with great success and launching a French subshop, Paulmann wanted to be able to list their products on various marketplaces, such as Cdiscount, and receive orders using ChannelAdvisor. However, Paulmann had one special requirement: they needed to be able to integrate their site with ChannelAdvisor so that orders would be able to flow down from ChannelAdvisor, into Shopware, then down into their ERP system. The result of this collaboration was the Infinite Connect:ChannelAdvisor – Shopware Connector. The first connection between Shopware and ChannelAdvisor, it allows products, stock, orders and shipments to flow between the two systems. The connector runs every few minutes, ensuring that new or updated products are available in ChannelAdvisor within minutes. The speedy operation guarantees that information in the two systems is always up to date and staff can focus on generating more sales rather than moving around data. The integration is useful for anyone who needs to connect Shopware to a 3rd party system. The structure of the product assortment was created in such a way as to not interfere with the business of specialised retailers, rather support it. A store locator offers the end customer the shortest route to the retailer in their vicinity. In the B2B dealer area, the retail partners can download marketing material and product catalogues, register for training courses and generate energy labels and CE certificates for Paulmann products.